Tiana Reid is a writer and PhD candidate in English and Comparative Literature at Columbia. Her writing has appeared in The Toast, Vulture, VICE, The Paris Review, and The New Inquiry, where she is an editor. 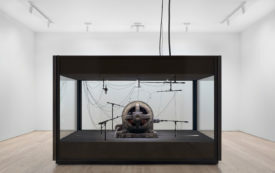 Kevin Beasley’s new Whitney show, built around a massive, whirring cotton-gin motor, argues for a new way to listen to the horror and beauty of history.